It was Monday, a few days before the Durga Puja, the festival of the Divine Mother. 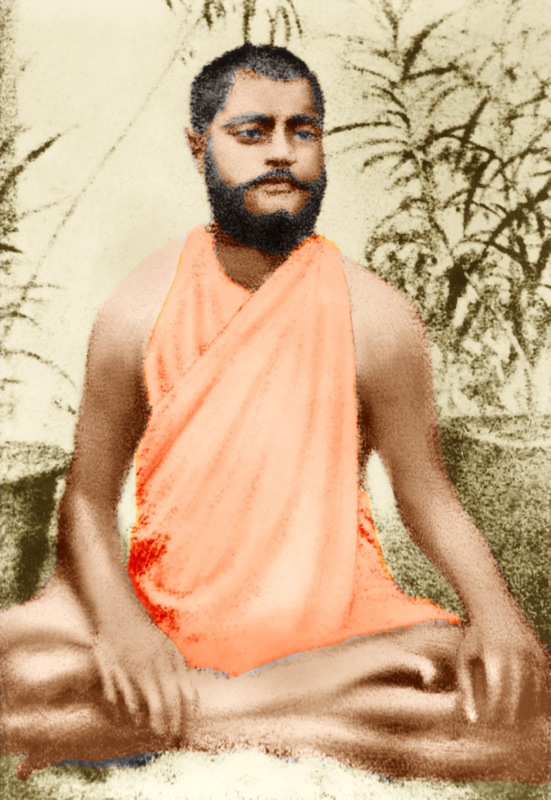 Sri Ramakrishna was in a very happy state of mind, for Narendra was with him. Narendra had brought two or three young members of the Brahmo Samaj to the temple garden. Besides these, Rakhal, Ramlal, Hazra, and M. were with the Master. Narendra had his midday meal with Sri Ramakrishna. Afterwards a temporary bed was made on the floor of the Master's room so that the disciples might rest awhile. A mat was spread, over which was placed a quilt covered with a white sheet. A few cushions and pillows completed the simple bed. Like a child, the Master sat near Narendranath on the bed. He talked with the devotees in great delight. With a radiant smile lighting his face, and his eyes fixed on Narendra, he was giving them various spiritual teachings, interspersing these with incidents from his own life. MASTER: "After I had experienced samādhi, my mind craved intensely to hear only about God. I would always search for places where they were reciting or explaining the sacred books, such as the Bhagavata, the Mahabharata, and the Adhyātma Rāmāyana. I used to go to Krishnakishore to hear him read the Adhyātma Rāmāyana. "What tremendous faith Krishnakishore had! Once, while at Vrindāvan, he felt thirsty and went to a well. Near it he saw a man standing. On being asked to draw a little water for him, the man said: 'I belong to a low caste, sir. You are a brahmin. How can I draw water for you?' Krishnakishore said: 'Take the name of Śiva. By repeating His holy name you will make yourself pure.' The low-caste man did as he was told, and Krishnakishore, orthodox brahmin that he was, drank that water. What tremendous faith! "Once a holy man came to the bank of the Ganges and lived near the bathing-ghat at Ariadaha, not far from Dakshineswar. We thought of paying him a visit. I said to Haladhāri: 'Krishnakishore and I are going to see a holy man. Will you come with us?' Haladhāri replied, 'What is the use of seeing a mere human body, which is no better than a cage of clay?' Haladhāri was a student of the Gita and Vedanta philosophy, and therefore referred to the holy man as a mere 'cage of clay'. I repeated this to Krishnakishore. With great anger he said: 'How impudent of Haladhāri to make such a remark! How can he ridicule as a "cage of clay" the body of a man who constantly thinks of God, who meditates on Rama, and has renounced all for the sake of the Lord? Doesn't he know that such a man is the embodiment of Spirit?' He was so upset by Haladhāri's remarks that he would turn his face away from him whenever he met him in the temple garden, and stopped speaking to him. "In that state of God-intoxication I used to speak out my mind to all. I was no respecter of persons. Even to men of position I was not afraid to speak the truth. "One day Jatindra came to the garden of Jadu Mallick. I was there too. I asked him: 'What is the duty of man? Isn't it our duty to think of God?' Jatindra replied: 'We are worldly people. How is it possible for us to achieve liberation? Even King Yudhisthira had to have a vision of hell.' This made me very angry. I said to him: 'What sort of man are you? Of all the incidents of Yudhisthira's life, you remember only his seeing hell. You don't remember his truthfulness, his forbearance, his patience, his discrimination, his dispassion, his devotion to God.' I was about to say many more things, when Hriday stopped my mouth. After a little while Jatindra left the place, saying he had some other business to attend to. "Many days later I went with Captain to see Rājā Sourindra Tagore. As soon as I met him, I said, 'I can't address you as "Rājā", or by any such title, for I should be telling a lie.' He talked to me a few minutes, but even so our conversation was interrupted by the frequent visits of Europeans and others. A man of rajasic temperament, Sourindra was naturally busy with many things. Jatindra his eldest brother, had been told of my coming, but he sent word that he had a pain in his throat and couldn't go out. "One day, in that state of divine intoxication, I went to the bathing-ghat on the Ganges at Baranagore. There I saw Jaya Mukherji repeating the name of God; but his mind was on something else. I went up and slapped him twice on the cheeks. "At one time Rani Rasmani (see Picture) was staying in the temple garden. She came to the shrine of the Divine Mother, as she frequently did when I worshipped Kāli, and asked me to sing a song or two. On this occasion, while I was singing, I noticed she was sorting the flowers for worship absent-mindedly. At once I slapped her on the cheeks. She became quite embarrassed and sat there with folded hands. "Alarmed at this state of mind myself, I said to my cousin Haladhāri: 'Just see my nature! How can I get rid of it?' After praying to the Divine Mother for some time with great yearning, I was able to shake off this habit. 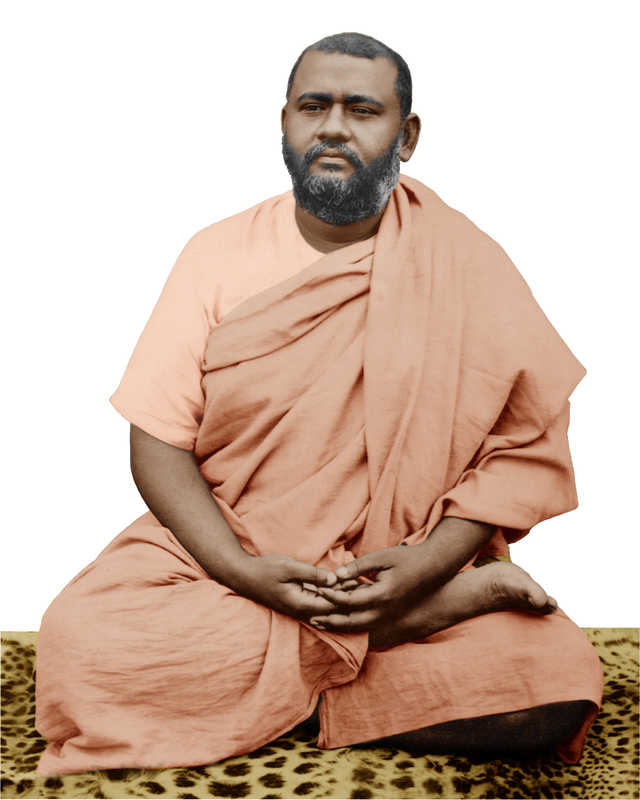 "When one gets into such a state of mind, one doesn't enjoy any conversation but that about God. I used to weep when I heard people talk about worldly matters. When I accompanied Mathur Babu (see picture) on a pilgrimage, we spent a few days in Benares at Raja Babu's house. One day I was seated in the drawing-room with Mathur Babu, Raja Babu, and others. Hearing them talk about various worldly things, such as their business losses and so forth, I wept bitterly and said to the Divine Mother: 'Mother, where have You brought me? I was much better off in the temple garden at Dakshineswar. Here I am in a place where I must bear about "woman and gold". But at Dakshineswar I could avoid it.' "
The Master asked the devotees, especially Narendra, to rest awhile, and he himself lay down on the smaller couch. Into that Ocean of Delight? Will find a haven at Thy feet. When Thou appearest unto me. Thou One without a Second, all Peace, the King of Kings! 1 shall enjoy the bliss of heaven while yet on earth! Where else is a boon so rare bestowed? Desert me at Thy dawn's approach. O Succour of the weak, fulfil my one desire! Myself, O Lord, attaining Thee. With His name's thunder, snap the fetters of sin! Made one with Him in Love's pure ecstasy. When the music was over, Sri Ramakrishna held Narendra in his arms a long time and said, "You have made us so happy today!" The flood-gate of the Master's heart was open so wide, that night, that he could hardly contain himself for joy. It was eight o'clock in the evening. Intoxicated with divine love, he paced the long verandah north of his room. Now and then he could be heard talking to the Divine Mother. Suddenly he said in an excited voice, "What can you do to me?" Was the Master hinting that maya was helpless before him, since he had the Divine Mother for his support?